SOMALIA: Halimo Omar: "There is no limit to the suffering"
AFGOYE, Halimo Omar, 40, fled fighting in Mogadishu, and is now living in a cramped, makeshift camp for the displaced near the town of Afgoye, 30km south of the capital. 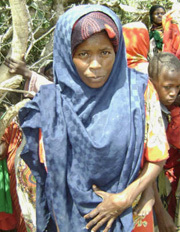 Her family first sought refuge in Jowhar, in the Middle Shabelle region, in the south, and later moved to Arabiska in Afgoye, where she lives with her blind husband and four children in a hut made of twigs, torn plastic and old clothes. "Every day and night there was fighting going on. It seemed that every house was hit. We finally decided to leave. There were dead bodies all over the place. Sometimes you had to step over dead people to get away. "My husband requires constant attention because of his blindness. It was hard taking care of four children and a blind man when things were good; it is even harder now, especially when one has to be ready to flee at a moment's notice. "My 18-year-old son used to help take care of the family. We used to both find work at Bakara market, but now even that is closed. We have been through a lot but this is the worst it has been in the past 17 years. "Previously, there was a limit to the suffering because everybody was not affected so you got some help. Now there is no limit, everybody is in the same situation, so you cannot expect or hope for help from anyone. "Now at the camp, I go into the bush every morning to collect firewood and later try to sell it at the roadside to add to what I get during the distributions [of relief food]. "But thank God we are at least alive. Many of our neighbours did not make it. I would like to go back but I don’t see how, with the situation the way it is. I am losing hope of ever going back to Mogadishu."